To watch the video, click on the play button above or click here to watch it on YouTube. Learning how to coupon at Target will help you save so money! First off, I LOVE Target! In my opinion, it is the easiest store to coupon in. If you are new to couponing, Target is a good place to start for a few reasons. First, there are no rewards to roll and they have great sales. Plus, there are so many options and ways to save money! Note: Coupon policies are always changing so make sure to print a copy of the Target’s coupon policy and get familiar with it. Mobile Coupons – You can get them as mobile coupons. Inserts – Sometimes you can find Target coupons inside weekly inserts. For mobile coupons to work, you’ll need a smart phone that has a web browser. To get started, text “Coupons” to 827-438. It’ll send you back a link, where you can sign up. Once you sign- up, you mobile coupon alerts. New mobile coupons typically come on a Saturday. You can also get the latest mobile coupon on demand by texting “Offers” to 827-438. The two above mobile coupon programs are always available, however Target occasionally puts out extra codes to text for more coupons. These will vary from “$10 off $50 Grocery Purchase” to “$3 off $15 Beauty Purchase”, etc. Sometimes they are groups of individual coupons (such as $1.00/1 item) rather than category coupons, as well. These will typically be advertised in the Target weekly ad, which you can find here. With mobile coupons, you’ll get a unique link via text message. If you click on that link, it will take you to a mobile web page that has a barcode on the top. Each mobile coupon consist of one or more offers. To get the deal, have the cashier scan this barcode at checkout. Any applicable coupon from the list of offers will be grayed out once that offer is used. Every coupon listed has a usage limit of 1. If you do not have a smart phone with a web browser, an alternative option is to sign up to Google Voice. It’s free with your Google account, just like Gmail. You can send and receive text messages via Google Voice. Some mobile carriers do not allow text messages with “short codes” to be sent or received. If this is the case, you’ll get an error message from your carrier when you try to text. If this happens, contact your carrier for more information. Some carriers will turn this on for you if you contact them. You can also access all your mobile coupons from the Target mobile app. Sometimes, there are several active mobile coupons and it can get overwhelming. This is a convenient way to quickly access all of them with a quick swipe. Just open the app and scroll down to the “Coupons” link. Click it and you’ll find all of your Target coupons easily in one location. You can even easily add another coupon by click the + sign in the top right corner. So simple! Go to Target.com and search for “Coupons” to find Target printable coupons. If there are any deals that use Target.com coupons, I will always link to them directly on FreeStuffFinder.com. When you print Target coupons for the first time, you’ll have to install some software but you only have to do this once. Target printable coupons typically have a limit of 1 per customer, unlike Target Coupon from inserts and other sources, which tend to have a limit of 4 per transaction. You can print 2 of the same Target coupons per computer. If you’re on a Mac and have a hard time installing the printing software, make sure to install it from Firefox web browser. Each piece of paper can hold 4 target printable coupons. So even if I just wanted one printable coupon, I’ll typically clip 3 more Target coupons that I may want just to maximize that print. I tend to look for extra coupons in these categories: baby, food and apparel. The in-ad coupons each week are typically category-based coupons. Category-based coupons are a discount that you can get when you buy a certain dollar amount from a particular category or from a participating list of products. These are different than item-based coupons. Cartwheel is a money saving program from Target that originally started out as a mobile app. It provides additional ways to save money using percentage-off offers on participating items. You can download Cartwheel app from the app store or you can access it online. Cartwheel is the easiest way to start saving money at Target if you are new. Each Cartwheel account has a unique bar code. You add offers into your account and show the barcode to the cashier at checkout, similar to a mobile coupon. Your barcode never changes, and you only get one barcode for all the Cartwheel offers you have. The limit on Cartwheel offers is 4 items per offer per transaction. You can repeat 6 transactions in a day on an offer. If you are using any Target coupons, the Cartwheel is applied to the remaining amount after the Target coupons have been deducted. Tip #1: If you do not have a smart phone, you can print out the Cartwheel bar code and bring it into the store with you. You can add the offers at home and use the bar code in stores. Tip #2: From the Cartwheel app, you can scan product bar codes to see if there are any Cartwheel offers on that item. To learn more about Cartwheel, click here to watch my in-depth video on the Ins and Outs of Target Cartwheel. Here are some of the rules to How to Coupon at Target. Additionally there may be cash back apps to lower the cost further. Note #1: Target printable coupon and mobile coupons are both Target coupons. You cannot stack them together on the same item. For example, if you have a Target Coupon that you printed for $1 off Glade Target coupon and you have a $1 off Glade mobile coupon, you cannot use both of these on one unit of Glade that you buy. Note #2: If you have a category-based Target coupon and an item-based Target coupon, you can use them together. $5 off $15 Personal Care is a category coupon. $1 off Crest Toothpaste Target coupon is a item-level coupon. You can use the two together in a transaction. The $15 threshold for the category coupon is before any item-based Target coupons or manufacturer coupons. Target coupons typically have a limit of 1. Target coupons from newspaper usually have a limit of 4. With manufacturer’s coupon, read the limits on your coupon. If a coupon doesn’t state any explicit limit per transaction or per customer, then the limit is 4 per transaction. Do not check out with more than 4 of the exact same coupon per transaction. The computer won’t accept it. Newbie Tip: Limit 1 per purchase is not the same thing as limit 1 per transaction. Limit 1 per purchase means you’re using one coupon per item purchased. In other words, you cannot use two manufacturer’s coupon on one item. Cartwheels have a limit of 4 items that an offer can apply on per transaction. I typically limit myself to no more than 4 items per transaction, out of habit. The Target REDcard is amazing! You can get a debit card or credit card version of it. Both versions have the same benefits. It’s quick and easy to sign up online here. Save 5% on all purchases paid on the REDcard! This alone gives you a reason to get the card. Extra 30 days for returns. Target has an amazing return policy of 90 days for most unopened items. Not to mention the 1 year return policy on Target-owned brands. a) Price Adjustment – If you bought an item and then you find that exact item on sale in next week’s Target ad, you can bring your receipt back to get the price difference refunded to you. Similarly, if you find a lowered price on Target.com, Amazon.com, Walmart.com, BestBuy.com, ToysRUs and BabiesRUs.com or in a competitor’s local printed ad, you can get the difference refunded to you if it is within 7 days. You just bring the proof of the current lower price and your receipt to guest services. b) Price Matching – This is the same as price adjustment except, before you buy the item, you ask for a lower price. You have to do this at Guest Services. They have iPads to verify online price matching, but you’re supposed to bring the competitor ad in for a non-online price match. My favorite place to price match is Amazon.com prices. Not Amazon marketplace sellers, but items sold and fulfilled by Amazon. The item has to match exactly and has to be available. Click here to see the price match policy. According to the policy, you can use manufacturer coupon when price matching. It becomes trickier with Target coupons and Cartwheels. The policy basically states that you can pick either the competitor’s price or the price after Target coupons, but not both. The thing that makes Target such a great place to start couponing is that they don’t have reward dollars you need to roll. Instead, they have gift card promotions. You can use coupons on top of gift card promotions to make some great deals. We have Playtex liners on sale for $3.99 this week. If you Buy 3 then you get a $5 Target gift card. We have $3 off manufacturer coupons. The nice thing about gift card promotions is that they never expire. You can easily use them on a future transaction. You can’t, however, use gift cards on the transaction that you earned them in. You can split your transactions so that you earn all the gift cards in transaction 1 and then use those gift cards to pay for transaction 2. Or, if you visit Target regularly like myself, you can save the gift cards for the next trip. An alternative to carrying physical gift cards, which can be lost, is loading gift cards digitally on to your mobile phone. You can login to mobile gift cards here. You can also combine gift cards from your phone in this mobile gift card interface. When it’s time to pay, similar to a Cartwheel or mobile coupon, just have the cashier scan your gift card barcode from your phone to pay. I like to do this so I don’t have to think about losing my gift cards. You can also combine multiple gift cards into one at guest services. Forgot to use a coupon? Or accidentally left a coupon at home? Many stores will allow what is called “Missed Coupon Adjustment,” where you can get the deal from the coupons after you’ve made the purchase. In terms of time limit, I’ve gotten different answers from different stores. Some stores may have 3 days policy and some may have 24 hours policy. I come back within 24 hours to be safe. You can get a rain check if a sale item is not available. The rain check allows you to have the sale price for the next 45 days at any Target store. Click here to see the Target Rain Check Policy. There are some items you cannot get a rain check on. For example, items that states “No Rain Checks” and items on Price Cut, Temporary Price Cut, and Everyday Low Price do not qualify for rain checks. Also, items on gift card promotions do not qualify for rain checks. Clearances at Target are typically found on end caps and discovering clearances can be a fun past time (at least for me). 🙂 Clearances start at 15%, 30%, 50%, 70% and 90%. The top right corner of the red clearance sticker has a little number. This is the percentage off from the regular price for this clearance price. It’s a quick way to find how much you’re saving without doing math. One thing I’ve learned is to always scan clearance items at the price checker. Sticker prices aren’t always the lowest price in the computer. DPCI stands for Department, Class, Item. It is a Target specific 9-digit number that uniquely identifies every item in Target. Shelf Label – Yellow shelf labels, it’s displayed under the price in small fonts. Sale Signs – On Red and White Sale sign or Yellow Price Cut signs, this number is displayed just under the bar code at the bottom left. Receipt – The numbers on the left side, next to each item description on your receipt. You can use this number to look up inventory in a store. For example, if you have the DPCI number and wanted to check if your store has a particular product left, you can actually enter this number at a price checker using the buttons on the left side. There are also online tools that allow you to check inventory using this number. However, be aware that these tools may not always be accurate. The information may be delayed by a day or two. Fyndly – Similar Target inventory checker. Probably accesses the same database as BrickSeek. If you have kids or have little kids you give presents to, the best time to stock up on toys is in January and July, when Target has their Semi Annual Toy Clearance. 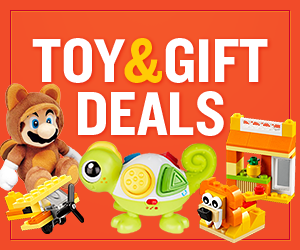 This is nationwide and it is the best time to shop for toys. If you plan your year carefully, you can potentially save a lot of money on Christmas and birthday gifts throughout the year. If you have an issue with a cashier, it’s best to politely take it up with a manager or at Guest Services. If your issue is still not resolved, you can contact Target Guest Services. There are several numbers to contact depending upon the issue you had. I’ve listed a few of the most common ones below, but you can also check here for all inquiries. 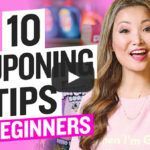 Want to learn how to coupon in other stores? Click here! Are you a visual learner? Click here to watch videos of my explaining past Target deals. Hi Mary, it’s hard for me to answer that one since I don’t know what kind of coupon you received. The category coupon you referred to is to get back a $5 gift card when you spend $20 on Beauty & Personal Care, not get $5 off. Depending on what type of coupon you received, you may be able to stack that with the beauty coupon. Just be sure to scan the beauty coupon first. It’s also possible you may have to meet the threshold of both coupons in order to use it ($15+$20 = $35). Hi Nicole! Yes! I plan to do an updated video. Thanks for the feedback!!! 🙂 Hope you’re having a great week! Tina: You have done an AMAZING job!! LOVE your site.